Thiel-a-Vision » Scooby-Doo, Where Are You? Home > TV	> Scooby-Doo, Where Are You? I swear that the programmers at Cartoon Network suffer from ADHD. Shows will disappear in mid-run, pop-up five months later at a different time and day, then inexplicably vanish again with several episodes still unaired. It’s frustrating, and doubly so if the series in question has an on-going story arc. I’ve written before about Scooby-Doo: Mystery Incorporated, which earlier this week reemerged from a forgotten closet at Cartoon Network headquarters to finish out its long-neglected run in a weekday afternoon burn-off slot. It should wrap up next week, unless the head of programming spots a shiny object. Perhaps the very qualities that made Mystery Inc. such a compelling series for older fans of the characters are what kept it bouncing around the schedule. It broke from the standard Scooby formula in favor of a two-season, 52-episode long storyline. * It romantically involved Velma and Shaggy, had Daphne (and later Velma) temporarily break from the gang, and revealed that Fred’s adoptive father was a villain who’d blackmailed his birth parents (who were part of a previous Mystery Incorporated team) into giving him up. Even more remarkably, it introduced elements of real danger. A couple of supporting characters have been killed (off-screen, but still) by the sinister machinations of Professor Pericles, the talking parrot who was the real brains behind the earlier incarnation of Mystery Inc. Okay, I realize that I have just typed the phrase “the sinister machinations of Professor Pericles, the talking parrot.” This ain’t exactly House of Cards. Yet, the notion that something going out under the Scooby-Doo banner has a murderous bird in it is strange and wonderful. And then, yesterday, this happened. 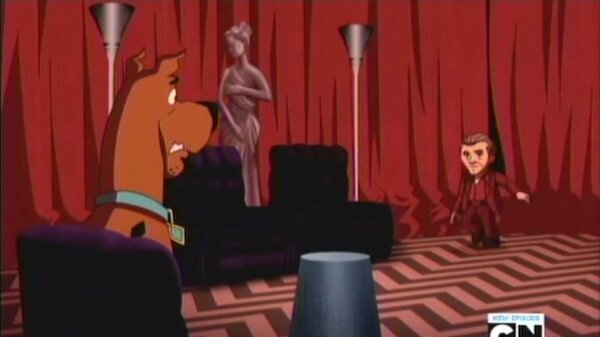 Scooby-Doo visited the Red Room (aka the Black Lodge) from Twin Peaks. Okay, it was a dream, but so was the original Red Room. And as the scene involved a metaphysical entity speaking to Scoobs through his dog girlfriend,** I’m willing to accept that yes, Scooby-Doo was in the Black Lodge. Agent Cooper and BOB were presumably in the next room over. And what was discussed? Oh, just that the reason certain dogs (and parrots) can talk is that they are the descendants of the Anunnaki,*** extradimensional spirits who can only physically exist by inhabiting the bodies of animals. Okay, maybe I do understand why this didn’t fly at the Cartoon Network. But that anyone ever allowed it to happen in the first place is as peculiar as any ghost encountered by those meddling kids. *Thanks to the delays, said storyline will finish out three years to the day from when it began. **Again, I totally get how ridiculous this seems when I type it out. ***The Anunnaki are a “real” thing, in that they feature in real-world crackpot theories regarding the rogue planet Nibiru (also namechecked in Mystery Inc.) and the end of the world.